Hong Kong customer service has improved tremendously. People are so friendly as compared to 10 years ago. I remembered I was scolded a couple of times for no reason in Hong Kong. I being a banana, not knowing how to read Chinese had difficulty ordering dishes in a restaurant. However I could speak Cantonese. The waiter upright told me to read the menu when I ask him for recommendation. If I took too long to order, the waiter will ask me to go away. However all that has change now. They are so polite. One of the waitresses even helped me to find a English menu for me to select what I wanted. As I was shopping in SASA, one nice lady came and started to help me with my shopping stuff. She is so friendly and told me a lot about promotions and offers. She didn’t follow me around, allowed me to take time to browse through what I wanted and told me where things were. No wonder SASA was awarded with the Best Customer Service. One funny thing happen while I was walking down the street, there was an old man in his security uniform. A westerner approached him and asking where the nearest MTR was. The old man didn’t understand any English. The westerner look lost and I just directed him to the nearest MTR. The old man asked me what he was asking and I told him the MTR. Later I asked him for direction to go to a shop. He was very friendly and told me how to get there. I must say that speaking in Cantonese does have an advantage, they cannot tell that I was a tourist. You must speak the right Cantonese and not Malaysian Cantonese. I learn most of it from watching TVB series. Ha! However a shop owner spotted that I was a Malaysian because I didn’t wear any warm clothing and I was in my short sleeve shirt. I didn’t feel cold although it was below 18°C, maybe too much walking. Any how he gave me a good price for the dried scallops and abalone strips. 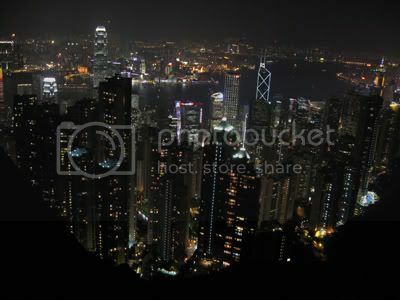 Frankly speaking, I don’t mind going back to Hong Kong again! 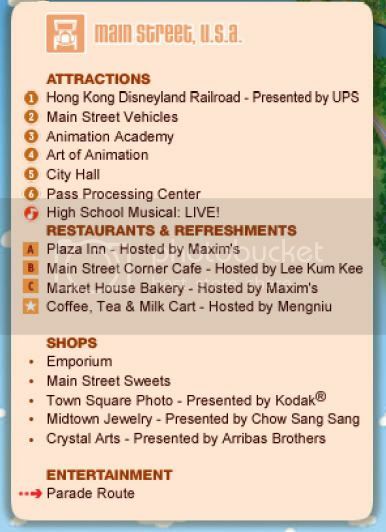 Hong Kong Disneyland is divided into 4 main sections: Main Street, USA, Adventureland, Fantasyland and Tomorrowland. You can visit the website for the daily schedule of the events, parade and fireworks. It changes from time to time. You can also get a schedule at the ticket counter. When I went there, the parade was at 3:30pm and fireworks were at 7pm. Park hours are from 10am – 7pm. 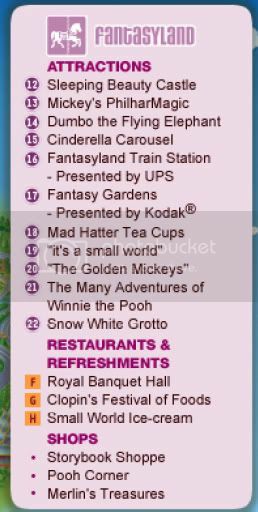 If you stayed in any of the hotels in Disneyland, you can get 2 days park ticket for the price of 1. You can also purchase Annual park ticket to get about 30% discounts on hotel rates on weekdays. Last tip, never get those over priced big balloons. Even if you have to get it, purchase it at the end of the day. You do not want to carry it around and you may not take it with you at certain rides. You cannot bring it on any aircraft too unless you deflate it. Hong Kong Disneyland Railroad – A train ride that will bring you round Disneyland. 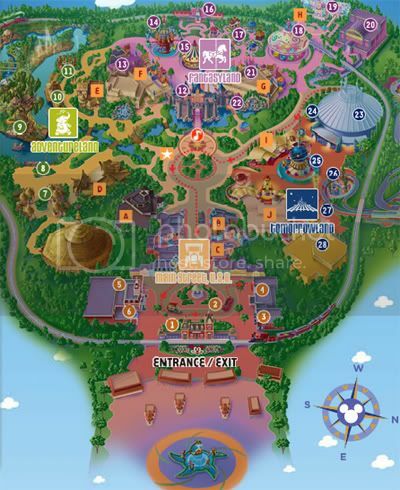 You can get an overview of the entire Disneyland. It will make a stop at Fantasyland. I found that the queue in Fantasyland is shorter than the Main Street. You can ride as many times as you like. Main Street Vehicle – It is a double-decker mini bus where you can cruise up and down Main Street with it. Shopping area – Most of the souvenirs shops are at the Main Street. You can get glass with a cartoon character and craft your name on it. Shows: Festival of the Lion King – You must watch this. It is a superb musical performance of the story of Lion King. Great singing, dancing and filled with action. 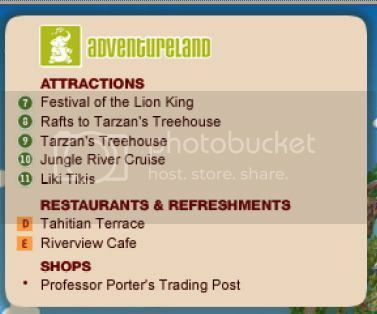 Rafts to Tarzan’s Treehouse – You can ride the raft to cross the river to Tarzan Treehouse. There is quite a queue to ride the raft. Tarzan Treehouse – Climb up on top of the Tarzan Treehouse to get a good view. There are interactive musical instrument that you can experiment with. Of coz you need to ride the raft to get back across. Jungle River Cruise – Cruise around the river and discovered many surprises. You may get wet or burned in this ride. Watch out for the long queue. There are 2 queues, one in English and one in Cantonese. I found that the English queue was shorter. Must ride. Show: Stitch Encounter – An interactive show with Stitch. We went twice because my gal wanted Stitch to ask her name. Both times she was disappointed. You will be asked to help Stitch to escape. It is very fun. Not much of a queue but it is a great experience. 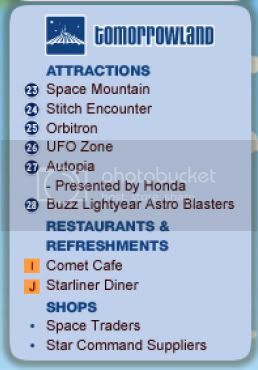 Buzz Lightyear Astro Blasters – An arcade type of ride where you are given laser guns to shoot at target points as you ride around. You can even adjust your seating to twirl around. At the end, you can check out your scores. It is a very exciting ride and I almost reach ranking L4. We went a couple of times as there was no queue. Autopia – Electronic cars ride that you can stir on the track. Even my four year old can drive, how cool is that. Watch out for the queue. We have to wait 20 mins. Space Mountain – A high speed ride like a roller coaster. Minimum height must be above 102cm. Not for folks with heart conditions. Orbitron – A flying saucer ride where you can adjust your height as you go in circle. UFO Zone – Water play to cool off. Good for younger children. Beware of getting wet. Show: The Golden Mickeys – The show was alright with cartoon characters dancing. Show: Mickey’s PhilharMagic – 3D show that you must see. It is a magical journey. Try catching the jewels and food with your hand. Watch out for water spray too and flying Donald! It’s A Small World – This is my favorite ride and it is new! You can see many culture, costume and colors. It is very well design. Must ride. Beside the beautiful dancing dolls, you can smell the nice fragrant too. The only part I didn’t like was, it is a long walk from the entrance to the ride. There is no short cut, bad design. I think I made 7 to 8 turns. Dumbo, the flying elephant – Similar to Orbitron where you ride on a flying elephant. Fantasyland Train Station – You can hop on to the train to go around Disneyland. Sleeping Beauty Castle – Here is where you take beautiful shots of the castle and where the firework display is. Try to get a good spot away from the castle for nice shots of the fireworks. Fantasy Garden – Photo taking with your favorite Disney cartoon. We got hold of Mickey, Minnie, Pluto, Goofy, Winnie The Pooh but missing Donald. Where is Donald? Mad Hatter Tea Cups – Riding on a cup and going in circles. You can twirl around faster by turning the table. I would suggest that you do not get up and walk immediately. You may fall down after the turning. The Many adventure of Winnie the Pooh – A journey to help Pooh find honey. Children adore this ride. Remember to smile as you approach the mirror as Winnie will take a picture of you. The picture will be display at the exit where you can order. Here are some videos on the fantastic time I have in Hong Kong Disneyland. Hope you enjoy it too! Today I wanted to bank in a US cheque from my stock broker. I went to CIMB bank. Usually I will go to my branch to bank in the cheque. This time I went into a branch nearest to where I was. Guess what? The bank officer told me that I have to bank in the US cheque in my own branch. *shake head* I asked her if my branch is in another state, I have to go back to the state just to deposit a cheque. She said she cannot comment. No choice I went back to my branch and deposit my cheque. What an absurd policy? A policy that gives their customers nothing but inconvenience. I don’t see why they cannot integrate within branches of their bank. I am so disappointed with local banks. 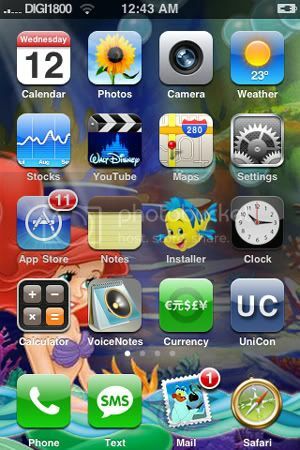 I just upgraded my iPhone firmware from 2.0 to 2.1 My friend sent me a link from iClarified and instructions were clear. The only mistake I made was I didn’t upgrade my iTunes before doing the upgrade. Result, my latest backup didn’t work. Sigh. Thank goodness I have a July backup. However some of the photos, SMS and notes I took vanished. 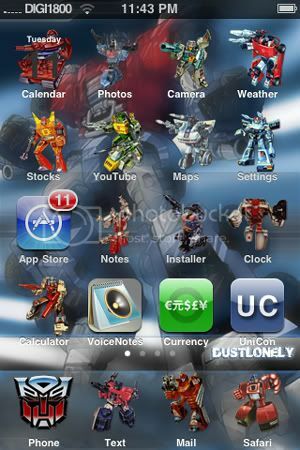 The best part I can have transformer theme and other cute themes. 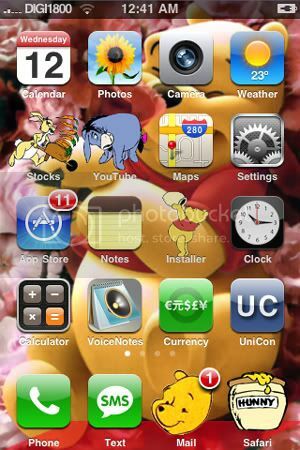 In order to install these themes, I need to download the themes from www.spaziocellulare.com. It has the most collection of themes. You also need to install WinterBoard from Cydia, the other installer. Lastly you ftp the themes into iPhone using WinSCP. Today I got another free new notebook to play with. 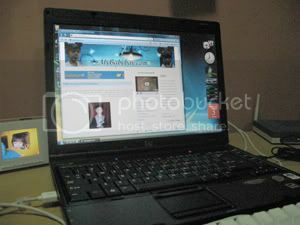 It is the Compaq 6910P. It has a 14.1 inch monitor and weighs 2.3kg. As opposed to my current working notebook which is lightweight 1.3kg. Should I switch? I kind of like the touch screen for volume scroll, volume mute, wireless button and presentation button. However I find that the volume scroll is not that sensitive. Overall the screen is huge and good for watching DVD. 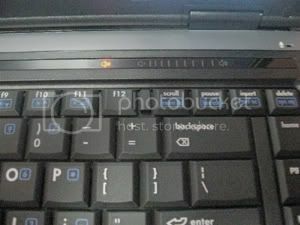 There’s a fingerprint reader for biometric security and it offers a TPM integrated security chip, so does my notebook. It is fairly quiet too. Anyway, I have to carry 1 extra kg every day, forget it. I will not switch. The thought me setting up a new notebook and configuring every applications give me nightmare. I will just give it to my project manager, not sure when he/she will be on board. Funny, the notebook arrived first before my new hire. I received a call from a strange guy professing that he is from Nationwide Express courier service. He called me asking for my address. Now if he is from a courier service, how come he does not have my address? Fraud? Of course I didn’t give him my address but instead I asked him for the company name, parcel ref no and the sender. He said he called me back. Second time he called, asking for my address again. Again I asked him for the details. However this time, he had my address but wrong street number. However I still want the details. Finally he gave me all the details. I really don’t know what kind of courier company who call the receiver for address? Beware of phone phishing but the above is a genuine caller from the NE courier service. We have to investigate every call because there are cons out there!